Call Sean for Heated Stone Therapy in Dublin/Upper Arlington and Pickerington. Before the actual therapy begins, Sean’s Massage Center strives to make their clients feel comfortable when they first step inside. Soothing music is played to build up the ambience of relaxation and healing. In most sessions, when actual physical contact is required, we use Aveda oil on a warmed massage table. Some of Sean’s specialties include full body massages, couples massages, reflexology, heated stone therapy, and other techniques. The Heated Stone Therapy requires less touching, but has very beneficial results. 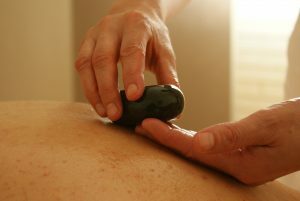 The penetrating heat from hot oiled stones is the primary element in Heated Stone Therapy. The body of the customer absorbs their heat which relieves muscular tension and eases him/her into a deep state of relaxation. As stress and anxiety melt away, the musculature tension eases and blood begins to flow clearly. This is an excellent form of therapy in relieving symptoms caused by stress, such as headaches, soreness and other maladies. In some cases, the warm stones can be applied with cooler stones to coordinate the flow of blood to help ease pain. Another advantageous effect of this treatment is detox. Blood is an important part of the body’s natural healing and cleansing processes. As the blood is allowed to flow more freely the body tends to flush out toxicity and restores balance to the nervous system. Sean’s Massage Center has two convenient locations to better serve the people in his region – Dublin and Pickerington. To schedule an appointment or receive our promotional material, you can call our clinic at (614) 327-4338, or go to the “Appointments” request page on our website. The details of your appointment will be confirmed by email. If you have any questions, please ask and we will answer them in the email. Sean McGrath of Sean’s Massage Center received his Massage Therapy License (LMT) on January 16, 1998. After attending the Central Ohio School of Massage in Columbus, he moved on to complete a 670-hour series of courses in anatomy, physiology, and hygiene. This gave him the deeper knowledge and skills to ensure a relaxing and therapeutic massage. Now, he is a proud member of The National Honor Society and The American Massage Therapy Association (AMTA).